"K&N Cold Air Intake --K&N – 57 SERIES FUEL-INJECTED COLD AIR INTAKE KITS. The world’s best fuel-injected cold air intake system. Series : K&N 57 Series FIPK. Boosts cold air flow which translates to more horsepower. Buy Direct from K&N. Free shipping! Warranty Type:Manufacturer Warranty. Warranty Duration:1 Year. Part Number: 57-6001. 57i Series Induction Kit. 57i Series Induction Kit; Incl. Air Filter/Adaptors/Hardware;. K&N intakes are designed to dramatically reduce intake restriction and improve air flow. This allows your engine to inhale a larger amount of air than the factory air filter assembly. NISSAN 300 ZX Z32 3.0 Twin Turbo 05/90-12/97 Coupe VG30DETT Engine Bay. These filters are washable and reusable and are custom designed to fit into your existing factory air box. With most vehicles you simply remove the disposable air filter and replace it with a K&N. K&N AIR INTAKE SYSTEMS. Oversized conical air filter extends use between cleanings up to 100,000 miles under normal highway driving conditions. Part # 57-6001. Air Filter. Exceptional durability, heat resistance, and a stylish, custom appearance. K&N AIR INTAKE SYSTEMS. Oversized conical air filter extends use between cleanings up to 100,000 miles under normal highway driving conditions. Part # 57-6002. Air Filter. Exceptional durability, heat resistance, and a stylish, custom appearance. K&N air intake products add horsepower, torque and acceleration to your vehicle. K&N air intake systems are available for cars, trucks, motorcycles, ATV's and RV's. K&N Million Mile Limited Warranty®. (Ï¿½ ) contain a high flow K&N air filter with uniquely designed adapters. This creates a radius entry allowing the engine to ingest air with less restriction compared to the factory intake system. 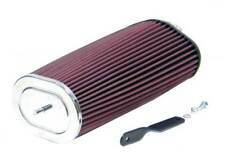 K&N air intake systems replace your vehicle's restrictive factory air filter and air intake housing. FIPK Intake. Your K&N 57 Series FIPK Air Intake is covered with a Million Mile Limited Warranty. Designed with a parabolic diverter chamber that increases air velocity while smoothing flow. How To Clean K&N Air Filter (PDF).